I stumbled on this bug while I was I was booking a dental appointment with Apollo hospitals . 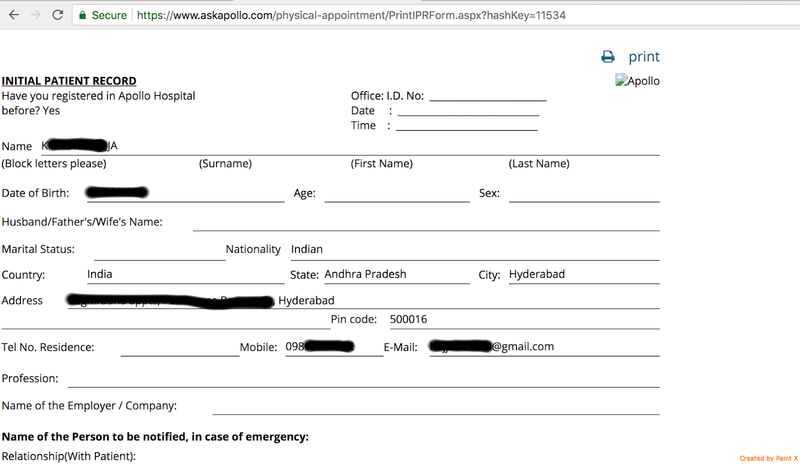 This bug was leaking 1 MILLION customers details who booked an appoint online with apollo hospitals. Since they are a big company , I thought it was my moral responsibility to help them get it fixed . But unfortunately they never replied to my emails. Then one day I heard of a nice guy named Elliot . Who disclosed a lot of vulnerabilities in Indian companies privately and helped them get it patched . So, I asked him if he could contact because he had more chances of getting response . And that worked . I am glad that apollo patched the vulnerability . But I wish like other companies they had a responsible disclosure program through which anyone could help them patch a security issues in an ethical manner. 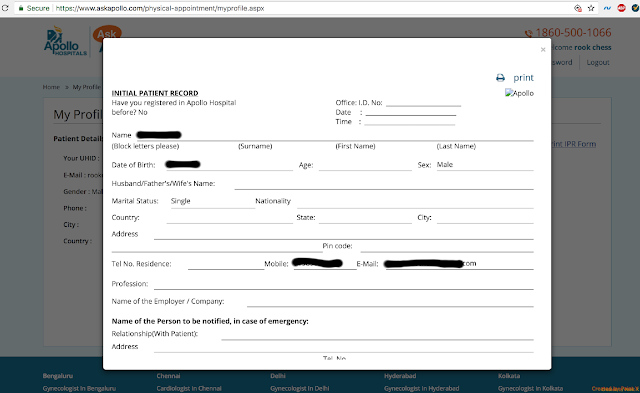 So Apollo Hospitals has an online appointment booking portal "www.askapollo.com" . When we sign up we get our profile created . Now there is an option to print IPR form . When I clicked on it . I got my IPR form autofilled . The auto fill request bought me into suspicion hence . I tried to look whats was going on in background. 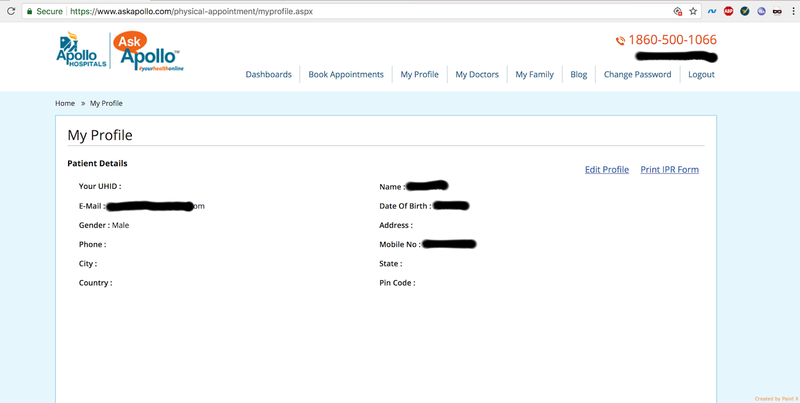 My sequential id was 11534XX which is (7 digits)... So, around 1 MILLION details of users could possibly get leaked if went in wrong hands. 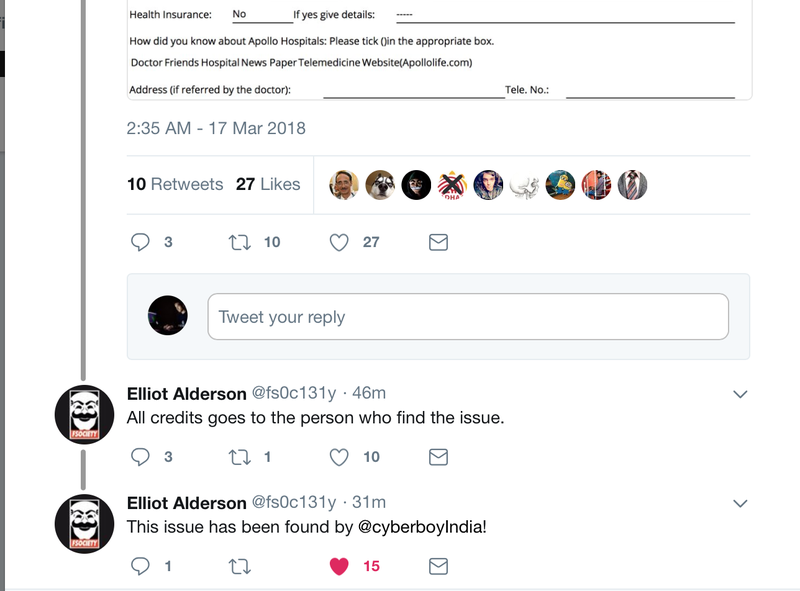 I would like to thank Elliot again for creating awareness among Indian companies about the importance of security when everything is getting online . We talk about Digital India but we are lacking very basic security measures almost everywhere. And as we are going more and more digital its very essential that companies should handle their customers data in a secure manner and one of the best methods is to have a responsible disclosure program. What parts or sections of a site are within testing scope. The types of bugs and vulns that are valid for submission. A dedicated security email address to report the issue (often security@example.com). If we look into counties like USA... Their airforce , pentagon , defence websites etc. have also adopted responsible disclosure program. These actions and understanding makes USA ahead of India. If we look at facts and figures . Indians received highest amount of rewards from facebook.com's bugbounty program. Facebook rewards ethical hackers for finding and reporting security vulnerabilities on Facebook's website. This means we do have resources but we are neglecting it. Indian companies need to be more open towards ethical hackers rather than being orthodox. Blogging about this bug was not to shame anyone. Its to spread awareness that we have to take security seriously which is highly neglected in India. Nice Find Shashank. India really need to work with the ethical hackers to secure their citizen's data. Hey can you recommend me some good books for web application penetration testing or what should I do to start in this area ?